British private security giant G4S has announced a pre-tax profit of £148 million for 2014, owning to its growing foreign expansion. RT took a closer look at the firm’s controversial track record. 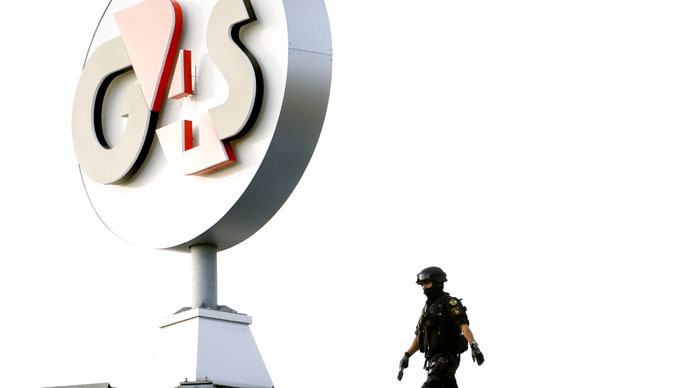 G4S saw its revenues from emerging markets overseas grow by 7.7 percent, with developing countries accounting for almost a third of the company’s business in 2014. However, the firm saw a 1.3 percent drop in revenue from the UK and Ireland. The British firm’s shift in focus to developing countries is evident by the spike in income from Latin American countries, which leaped 11.8 percent in 2014. The figures represent a reversal of fortune as the firm made a £190 million loss in 2013. G4S remains a controversial player in the security sector. Activists accuse it of turning a blind eye to over-charging, cost-cutting, negligence and human rights abuses. While G4S has an ethical policy framework in place, evidence suggests a significant gap between its commitments on paper and its practices. The firm publishes a list of its Corporate Social Responsibility (CSR) indicators online. Alongside each indicator, G4S states whether it conducts a “full” or a “partial” report into the issue. According to its website, G4S does not conduct “full” reports into how its business activities impact on human rights. In fact, G4S do not conduct any “full” reports into to the three indicators which are categorized under human rights: child labor, forced labor and the share of the firm’s operations that have been subject to human rights reviews. John Hilary, Executive Director of War on Want, called on organizations to think twice before offering G4S contracts. “We know that G4S has already lost millions of dollars in contracts as a result of the growing wave of popular action against it,” he told RT. Mindful of the firm’s failure to fully investigate its ethical practices, RT compiled a list of past instances G4S has broken standards. G4S made national headlines in October 2010 when Angolan deportee Jimmy Mubenga died after being restrained on a British Airways plane shortly before take-off. Three guards employed by the firm were charged with manslaughter, but found not guilty after a six week trial in December 2014. An elderly man was handcuffed to a G4S prison officer for eight days in March 2012 despite having just suffered a heart attack. Peter McCormack, 79, was only released when he had a heart operation. Judge Graham Wood ordered G4S to pay compensation for breaching McCormack’s human rights. In 2013, G4S was forced to pay out £109 million after an audit found it overcharged the British government for electronic prisoner tags. It was cleared by the Cabinet Office in April 2014, which said the firm had taken “positive steps” to change its practices. Corporate Watch accuse G4S of violating articles 76, 66 and 49 of the Fourth Geneva Convention for transferring prisoners from the Occupied Territories to Israeli prisons. The company also allegedly provides equipment to Israeli police forces and a prison in the occupied West Bank.
.@G4S_UK stop providing security for Israeli jails where Palestinian kids are locked up and torture reported. G4S guards were accused of torturing inmates at Manguang maximum security prison in South Africa in October 2013. Researchers at Wits University interviewed prisoners who said they were given electric shocks and beaten. G4S denied the allegations, saying it has a “zero-tolerance policy” to torture. In a few years time there won't be a #police force. It will be G4S or some other private force. We will have less rights in the future. G4S was fined AUD $285,000 for its role in the death of Aboriginal elder Mr. Ward, who suffered heatstroke while being transported in the back of a van without air conditioning in 40-degree heat. The company pleaded guilty to failing to ensure Mr. Ward’s health and safety.